Agency iD Experiential has created interactive pods to offer previews of a new housing development planned for the Athletes' Village after the Olympics. Visitors won't be able to see the East Village until early next year and houses won't be ready until summer 2013, but the iD pods offer a window into what the development will be like. The pods appeared at the Taste of London festival and commuter stations in June and July and will be set up at Bluewater and Lakeside shopping centres in September. 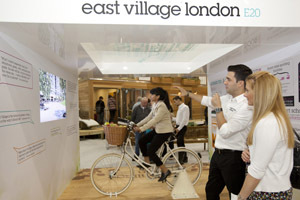 Visitors can sit on a bicycle and watch a screen for a virtual ride through the village, exploring the architecture of the future neighbourhood and its parks, water features and social spaces. A tactile wall and multi-touch screen are also part of the pod, allowing people to explore other features of the village and the bars, restaurants and shops in the wider Stratford area. The pods are iD's first property campaign. Katharine Walsh, on behalf of East Village, said: "One of our big challenges with this development is how we build excitement and interest in a neighbourhood that the public can’t actually get in to see until next year. The experiential pods and mobile marketing efforts that iD have created and managed for us have been the perfect vehicles for overcoming and meeting this challenge in a highly creative yet very effective and quantifiable way." Will the building developments for the Olympics lead to an increase in experiential events in the property sector? Comment below and let us know what you think.